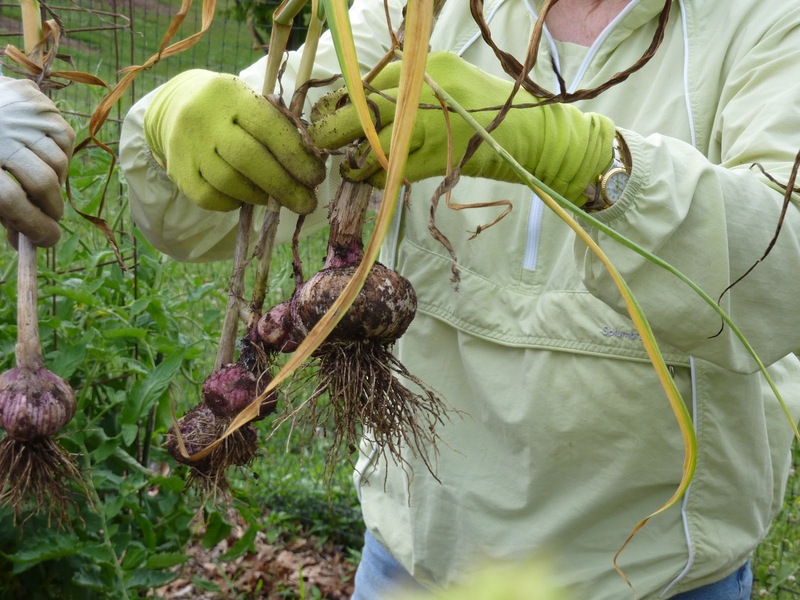 Here’s a late report on this week’s Tuesday harvest at the Derwood Demo Garden. You may recall, though I haven’t talked about it in a while, that this year’s vegetable team is working on solutions to some of our pest and climate problems in common vegetables. 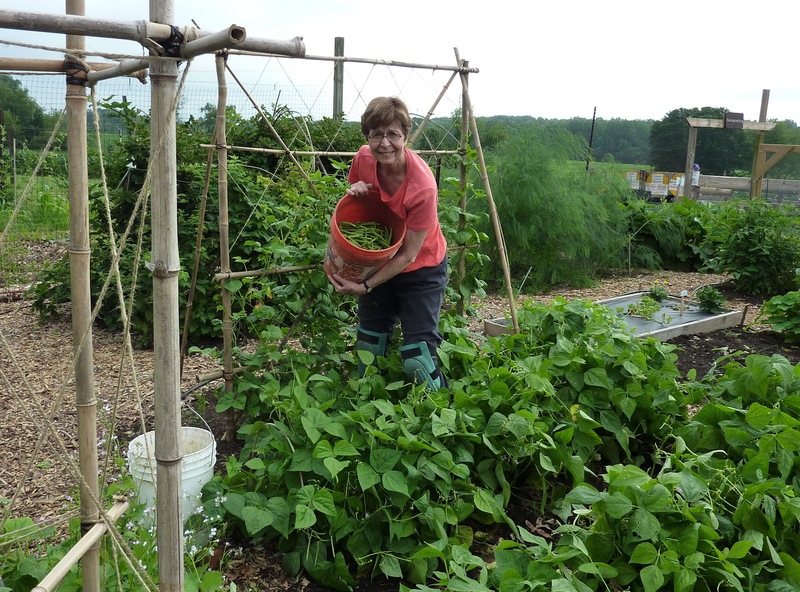 Darlene Nicholson is the Master Gardener in charge of bush beans, and one of the types she planted is Provider. This bean provides (ha) an early harvest, because it is cold-tolerant and will germinate in cool soil. Darlene’s April planting of Provider is now yielding beans in large numbers. In the photo, MG Carol Pihlstrom is in the middle of harvesting the two short rows. Combined with Darlene’s harvest of a few days earlier, we got five gallons of beans. Those are some prolific plants. Two thumbs up for Provider. Keep your fingers crossed, but the garden is remarkably free of insect pests so far. We do have some cucumber beetles and flea beetles, but hardly any potato beetles, and we’ve so far spotted (and squished) only one adult squash bug. There were two sightings of a brown marmorated stink bug on Tuesday. It may possibly have been the same bug. Lots of enormous onions! These went in as plants in mid-March. 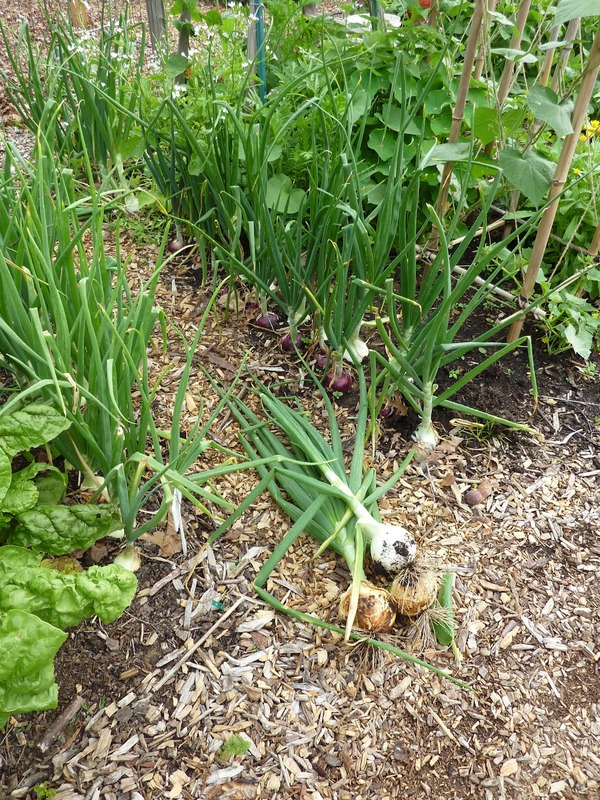 Some pretty serious rocambole garlic, which was planted last October. I’ll give you updates on some of our other plantings soon.